71. Why doesn't the Auto paper size setting work with Canon DR series scanners? There is simply a problem with your settings. EzeScans 'Auto' papersize option does work with Canon DR Series scanners. Please make sure that the F6 Job Admin scanner tab, Papersize option is set to Auto, MT option is unticked and SA option is ticked. Make sure that EzeScan 4.1.48 or higher is installed. 72. How can I automate the definition of OMR zones? In the Define Template window select Group from the Object Type dropdown. Click on the Pencil icon (to create a new object) and highlight a group of OMR zones. Hint: When selecting the zone area, try to make sure that the space outside zones is half the size of the space in between the zones. (This is so EzeScan can evenly work out where the OMR boxes reside). 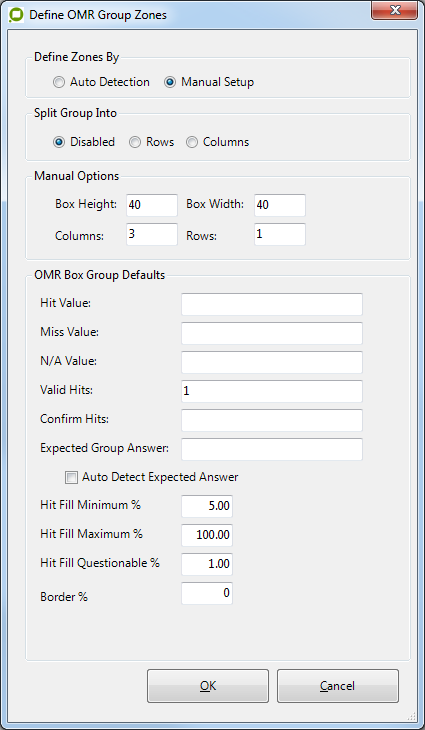 When the area has been selected, a "Define Group Zone OMR Boxes" window will appear. This is where we specify our zone info. We have 2 rows and 5 columns of boxes. Our groups are going to be split by row. 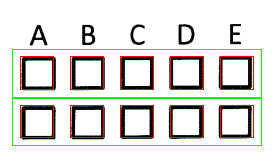 Our valid hits are going to be A,B,C,D,E. Our box height and width is going to be 80 x 80 pixels. When you’ve set up the zone information, click OK. The zones will be automatically drawn. The final step is to fill out the OMR defaults. By default the OMR hit is 5% fill. Select Data from the Object Type dropdown. You can then specify options like the Questionable Fill, Border, Width, Height, Hit Fill Minimum, Hit Fill Maximum, Hit Value, Miss Value. 73. What TIFF Printer driver can we use with EzeScan? EzeScan does not include a TIFF printer driver out of the box. However there is a PDF/TIFF printer driver at http://www.pdfforge.org/products/pdfcreator. It is easy to use and free (GPL) software. So if you want to create TIFF files from Email, Word, Powerpoint, or any windows application that can File->Print then we could suggest you take a look at the PDF Creator product. The website includes an MSI pack age that makes installation easy. When using EzeScan Routing as a service, and Routing rules are saving to a network path you must ensure that the EzeScan Service account has write access to them. When Routing is run in UI mode EzeScan uses the current user login to store to the network path. So this functionality will work ok. When Routing is run in service mode it uses the Local System account. This account will not have permissions to network paths. It is advisable to configure the EzeScan Routing service with a domain login which has local administrator access and write access to all network paths that the Routing rules are configured for. If you are not aware of your LDAP structure then the following command is recommended. Note: This needs to be run from the domain controller or a windows member server of the domain. In Command Prompt type the following: "ldifde -f c:\ldapout.txt"
The top line will contain the root of your LDAP tree. Simply copy this line from DN onwards. To Configure EzeScan LDAP, Select Admin, Options, then the Security Tab. 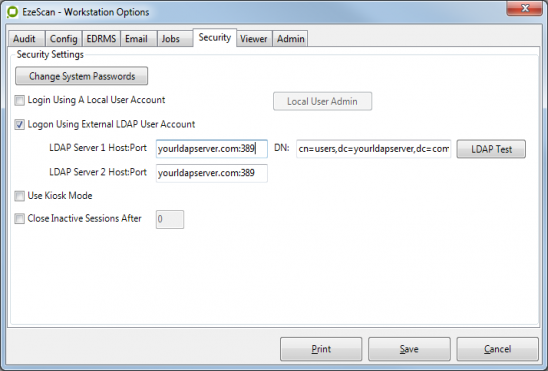 Tick "Login Using External LDAP Account" Note: An admin password must be set first"
Below is a sample LDAP Configuration. If you wanted to only allow EzeScan to authenticate to only to a group of users you would then specify the LDAP container that these members reside in. To find out to correct LDAP path, simply search for a user in this group in the ldapout.txt file. After where is says "cn = Joe Bloggs" there will be the user's LDAP path. Simply copy that into the DN field in EzeScan. In EzeScan 4.2.165 and above, EzeScan will automatically resize the text in the Job button. This will allow the operator to be able to give longer job names. There is also an option to add a description under the job name as well. An EzeScan Placeholder is a value that is stored when EzeScan is processing an image. Below are the Placeholders. These Placeholders can be specified in the Base File Name or used in the EzeScan KFI Module. Please refer to the EzeScan User Guide KFI for more information. Note: To enable this, the option “Generate Document Identifiers” in the Workstation Options, Jobs Tab must be enabled. <<S21>> This is an incrementing Document Identifier that is reset every day. <<JOB>> This value is the current Job name from the selected Job Type. This is usually appended to the default import and output folders. <<PAGENBR>> This is the current page in the EzeScan viewer. This option is usually used in the Advanced Markup -> Add Comment setting. <<BD1V1>> This is the barcode value defined in the barcode 1 setting on the profiling tab. <<BD1V2>> This is the optional barcode value defined in the Barcode 1 setting on the profiling tab. <<BD2V1>> This is the barcode value defined in the Barcode 2 setting on the profiling tab. <<BD2V2>> This is the optional barcode value defined in the Barcode 2 setting on the profiling tab. <<BBHV1>> This is the barcode value defined in the Batch setting on the profiling tab. <<BBHV2>> This is the optional barcode value defined in the Batch setting on the profiling tab. Setup a KFI Field (e.g. called Date_Created) and set its format tab options to a Date requiring DD/MM/YYYY format. Then on the output tab, use the 'Add suffix to output value' option to add the (Time Processed) to the field. This will add the <<(Time Processed)>> string to the field. Then insert a space before this <<(Time Processed)>> string. Then when the KFI field runs, EzeScan will take the date entered by the user in DD/MM/YYYY format and append to it the time in HH:MM:SS format. 79. EzeScan won't run after restoring an entire EzeScan configuration. EzeScan may fail to start after restoring an entire EzeScan configuration from a PC running Windows XP to a PC running Windows Vista (or vice versa). To resolve this issue please follow the instructions listed below under your current Windows operating system. 2. Open the file Ezescan.cfg in Notepad or Wordpad. "Documents and Settings\All Users\Application Data" and replace with "ProgramData"
4. Save the configuration file and exit. "C:\Documents and Settings\All Users\Application Data\Outback Imaging\Ezescan\"
"ProgramData" and replace with "Documents and Settings\All Users\Application Data"
80. Discovery is returning dates in a mirrored format. When using Discovery to search for a date in a format that has only two numerical values for the year, on some PC's that value is returned in a mirrored format. For Example, the date on the image might be in the format DD/MM/YY, but when you use discovery to retrieve that value the date returned is in the format YY/DD/MM. This can also cause discovery to return an incorrect value when using the '+number' command in the KFI form to add a number of days to the date. This problem is directly related to the Operating Systems default Short Date format settings in the Regional and Language Options. 1. Go to Control Panel (If you are using Windows Vista enable Classic View). 2. Open Regional and Language Options. 3. Within the Regional Options tab select the drop down option 'English (Australia)'. Short dates found using the Discovery module will now be defaulted to the Australian English format DD/MM/YYYY.